Energy, in all forms and functions, is the acknowledged driver of economic opportunity and growth. 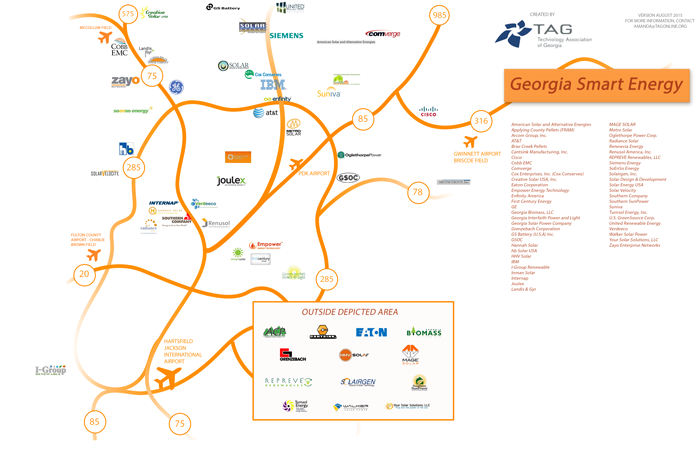 Here in Atlanta and all across Georgia, Smart Energy represents a diverse amalgam of innovation-powered technology and industrial manufacturing businesses, combined with world-class academic, engineering and research institutions. It’s a dynamic web of commercial and entrepreneurial talent – more than 5,000 strong – backed by infrastructure and resources currently fueling an economic sector with impact of more than $2 billion and counting. Georgia is home to global brands that are proven pace-setters in energy innovation, yet within a universe of hundreds most are young, innovation-driven technology plays. From electric power generation and energy conversion to electric distribution infrastructure and energy utilization, to advanced technologies in electric vehicles, smart buildings, smart appliances, and energy management systems – including world-leading battery technologies – Georgia’s Smart Energy sector leads. TAG Smart Energy is the catalyst for the people and promise of economic opportunity in energy. The foundation is here, and we’re just beginning to lever the region and state’s considerable Smart Energy assets for growth that’s high quality – to match the lifestyle of this vibrant Capital of the Southeast.